The Simms Headwaters Pro Mesh Fly-Fishing Vest is another awesome Simms fly-fishing mesh vest that is designed with a 100 percent nylon ripstop fabric with 100 percent polyester lining with a water resistant finish. This Simms Headwaters Pro Mesh Fly-Fishing Vest contains a total of 20 pockets where you can store all of the necessary fly-fishing gear you’ll need for a wonderful day of fly-fishing that include 4 chest pockets, 4 waist pockets, 4 internal pockets and 1 zippered back pocket. This Simms fly-fishing vest is also designed with a padded rib knit collar and 2 patented built-in retractor clips. This fly-fishing vest definitely has plenty of storage room and a great mesh vest design which is great for many different weather conditions that you may face when fly-fishing your favorite fly-fishing destinations. 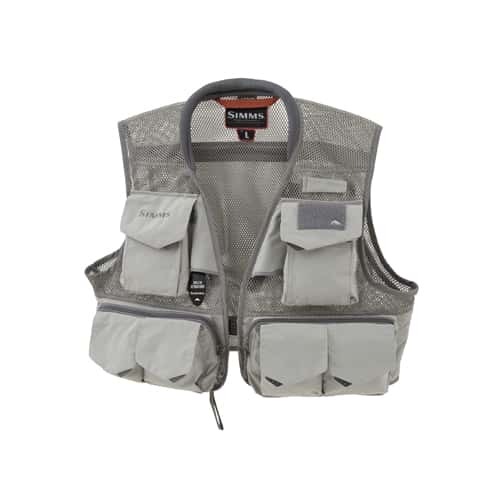 This Simms Headwaters Pro Mesh Fly-Fishing Vest is a lightweight mesh vest that is regarded among the top fly-fishing vests on the market today due to its extreme durability and functionality as it provides fly-fisherman with a scientifically enhanced fly-fishing vest that lives up to high standards among all fly-fisherman for being a top quality fly-fishing vest. I purchase my Simms Headwaters Pro Mesh Vest from the Platte River Fly Shop for an upcoming late Spring trout trip. The vest looks and fits great. Enough room to fit over a sweatshirt and rain jacket if the weather turns a bit bad. I like the pull down swivels and the abundance of pockets. Looking forward using the vest on my upcoming trip. The Platte River Fly Shop has excellent shipping. My vest shipped the same day I ordered it and was delivered in excellent condition two days later. That's pretty Super service in my book.